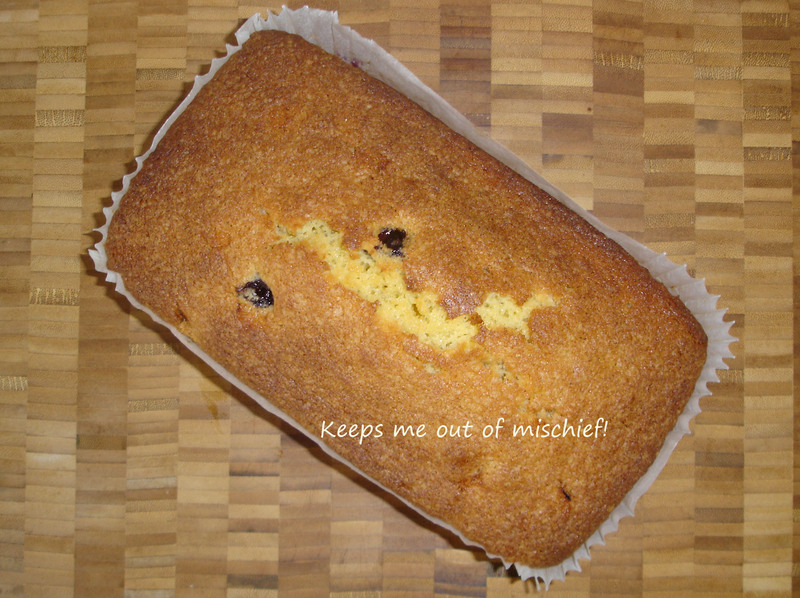 Blueberry Loaf | Keeps Me Out Of Mischief! Whenever we go on a camping trip I always take lots of home baked goodies with us. They’re great as pudding if we’ve cooked at the tent or to add to our day packs when we go out walking for the day. I normally take some form of flapjack and a loaf cake of some description. Loaf cakes are easier to pack in a lunchbox which then packs easier in the car than a round tin and are certainly easier to slice and eat than a fancy round cake! For our last trip I took Cherry and Coconut Flapjack and this blueberry loaf. Preheat the oven to 180°C and line and grease a loaf tin. Cream the butter and sugar together until light and fluffy, add the eggs one at a time mixing well in between. Sift in the flour and mix well. Add the frozen blueberries and mix gently. I use frozen ones so that they don’t explode in the oven! Pour the mixture into the loaf tin and bake for 50-55 minutes. The cake’s cooked when a skewer pushed into the middle of a cake comes out clean. Leave the cake in the tin to cool.